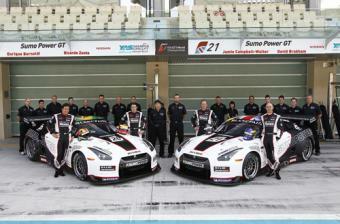 After the recent announcement that all four of its drivers are confirmed for 2011, the Sumo Power GT team has arrived in Abu Dhabi and is preparing for the first round of this year’s FIA GT1 World Championship, which takes place at the impressive Yas Marina Circuit this Saturday, 26th March. All four drivers: Ricardo Zonta, Enrique Bernoldi, David Brabham and Jamie Campbell-Walter had an opportunity to drive the team’s pair of Nissan GT-Rs at Zolder in Belgium two weeks ago. Although track-time was limited, each reported they felt comfortable in the cars and are eager for more seat-time to get properly dialled-in. The team was also pleased that, although having undergone a complete rebuild, both cars performed well - even on base-settings. The next time the two Sumo Power GT Nissans will see the track will be on Wednesday (tomorrow), when the championship’s first official test is held at the Abu Dhabi circuit. When the team arrived at the Yas Marina track last year, the whole operation had only been in existence a few weeks. Now, with a season of competition in the FIA GT1 World Championship behind it and with an impressive line-up of drivers, hopes in the Sumo Power GT camp are high that it will get its 2011 campaign off to a flying start on Saturday. Qualifying for the opening round of this high-profile global sports car series takes place on Friday afternoon at 19.45 UAE time (15.45 GMT), with the first of the weekend’s two, one-hour races, taking place at 13.15 (09.15 GMT) on Saturday. The second – the main Championship race – gets the green light later the same day at 19.45 (15.45 GMT).